Middleton, NS is a small, quiet town of under 2,000 people. It only has one traffic light which was put in place about a year ago. We moved here in 2009 and it was an adjustment to get used to rural living. One assumption I always had about small towns is that they are safer than the city. When I lived in Edmonton, I never forgot to lock my car (or house) because of the crime. Living in Middleton, I got lazy and forgetful and there were many times I just never bothered to lock my vehicle whether it was parked in the driveway or while we were out shopping. Over the course of the last few months though, I’ve learned that crime does exist in a small town. We’ve had someone go into our vehicles three times this year already. Of course, the doors were unlocked because we stupidly assumed we were “safe” in such a small town. The first time the thief stole some loose change and John’s prized lighter from Caesar’s Palace. He was more upset about that lighter than anything. The police suggested it was a crime of opportunity and to lock our doors. We did for a long time, but were still forgetful. The next time it happened a couple months later, there was nothing taken since I keep the vehicles pretty much empty now. I only knew there was a break-in because they had opened up the console and had moved things around. I didn’t bother to phone the police that time. Just two weeks ago, we returned late one night from a trip to Ontario to visit my family over the Thanksgiving long weekend. We were beat after the traveling and made our way to bed forgetting to lock the vehicles. It’s like someone was watching us get home because that night at 2:54 am, someone went into both our vehicles. Are you wondering how I know the exact time? It’s because we got it on VIDEO! <==== Go watch it and see for yourself! Right before we went on our trip we installed Dropcam, a Wi-Fi Video Monitoring camera. John placed it in our upstairs window facing the driveway. I noticed that morning the console was again up and the car looked rifled through once again. Nothing was taken because I don’t keep anything in the car. I went back to look at the recording from the previous night and lo and behold, I see a guy in a hoodie make his way to our house and go through both our vehicles. It was dark so we can’t see his face clearly, but we could definitely see someone rummaging through our cars! I wish we had a street light near our house so we could have seen better! I called the RCMP again and talked to the dispatcher. She had me email her the video of the recording and said that someone would get back to me if they had any questions. I never heard back from the police though. Maybe because nothing was stolen? Anyways at least they have the video and we know we aren’t crazy. There is a thief on the loose in Middleton and we have it on video to prove it thanks to Dropcam! 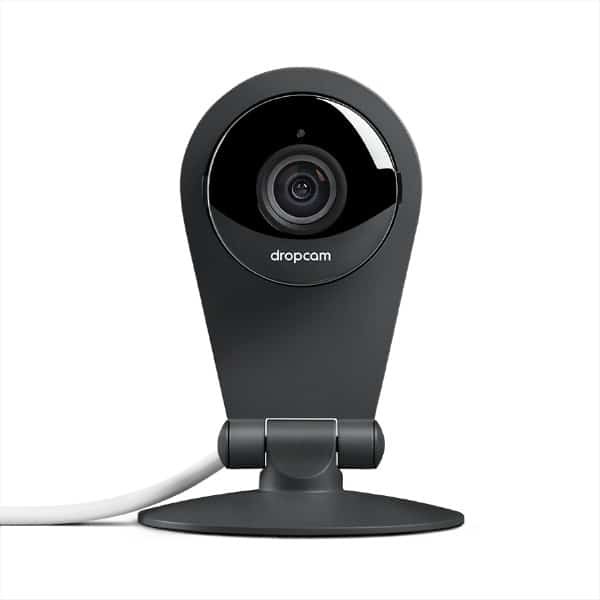 Dropcam is an easy to use home video monitoring camera that connects through your Wi-fi so you can see and hear what’s going on remotely via the app or by logging into the Dropcam site. It has multiple uses including the one I mentioned above: home security. You can also use it to keep an eye on any area of your home and watch your kids and pets. Another idea is to set it up at your front entrance and see if any packages are dropped off during the day while you’re not there. If you are having an issue with neighbours stealing your packages, Dropcam would be most helpful there! Dropcam boasts a 60 second setup and they are right. It’s literally just three easy steps. You plug it in and connect it to your home Wi-fi and then set up your free Dropcam account. Then you can place it wherever you want in your home. We wanted to watch the front of the house since we were leaving the day we set up to go to visit family in Ontario. John just placed it in the front window facing the road. It comes with hardware so you can mount it on a wall too. I downloaded the Dropcam app for free on my iPhone. It also is available on Google Play for Android users. If you wanted to you could sit and watch your Dropcam all day and all night long. John spent the first couple hours watching it on the computer upstairs and he’d yell down to me that a car drove by. It was a novelty to him and he thought it was so neat! I went to the grocery store and waved to him from the driveway since I knew he was watching. It’s AC powered so you don’t have to worry about batteries dying. You can see what’s happening anytime, anywhere. When we were in Ontario, I checked out what was happening a couple times a day via the Dropcam app on my phone. It was pretty quiet (and nice weather too!). 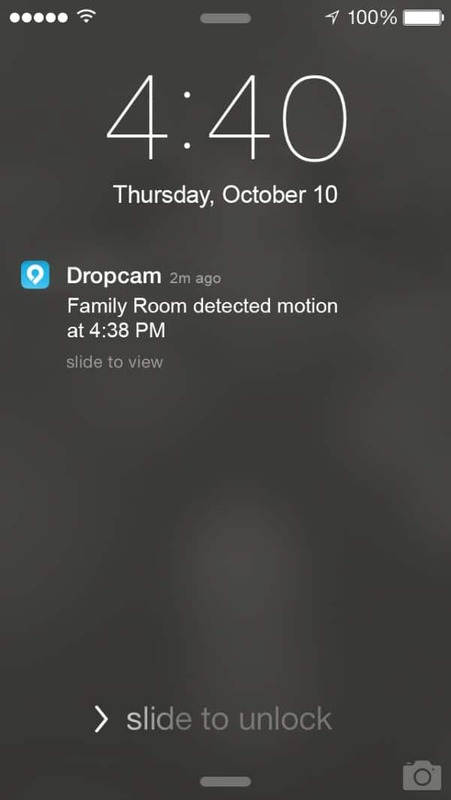 Receive notifications when Dropcam detects motion or loud noises either by email or via a push alert on your mobile device. I have the push alerts set up on mine so I get a notice anytime a car drives by or there’s someone at the door. This is totally optional so you don’t have to turn these on if you don’t want the notifications. Night vision turns on automatically and allows you to see what’s going on even in the dark. We were in Ontario the first night and I was curious about how much it would show. It was hard to see because of the glare of the window and the front porch light being turned on. I was able to turn off night vision remotely and could see a little better. If the Dropcam was set up watching the inside of the house, I’d have been able to see a lot better. 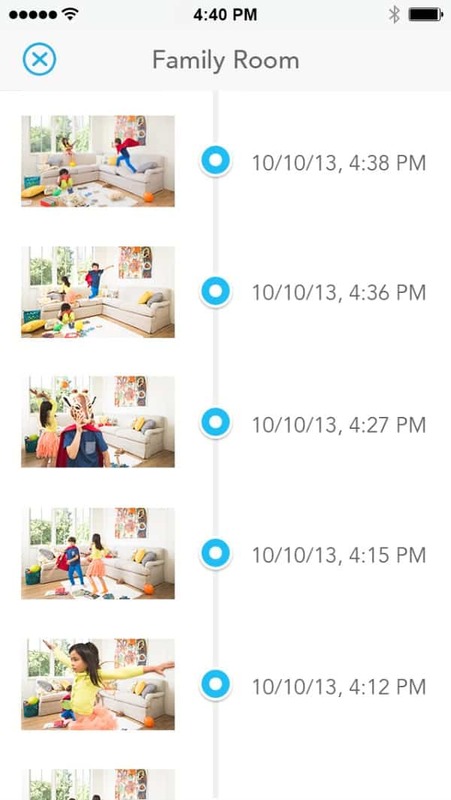 This feature lets the Dropcam act as a two-way audio so you can respond to what is happening in your home. I’d imagine it would be good if you had your Dropcam set up to watch your pets. I can see myself telling my cat, Princess to stop kneading the couch! For an even better view, you can zoom in to see a more close up view to what is happening. It’s easy to zoom out again to get the full picture. You can do this via the web or by using the app on your phone or tablet. I was wondering WHO would be able to see my video. I learned that Dropcam uses bank-level encryption to keep your video secure and Dropcam themselves can’t even see it. If you choose to let people see it like I did with the footage of my car break-in, you can easily create a clip and share it with your family, friends (or police!). Dropcam can go anywhere you want inside your house. You can’t use it outside though because it would be exposed to the elements. It needs to be in range of your Wi-fi. Mount it to a wall or set it on a table, ledge or wherever you like. It’s small and discreet looking and mine is barely noticeable in my front window. People only see it when I specifically point it out to them. It has a sleek design and comes in muted silver or black. It’s about the size of a deck of cards. My Dropcam is the Dropcam HD (now just called “Dropcam”) which retails for $149. Stunning video quality. Dropcam Pro incorporates a six-element, all-glass lens (a first in the home monitoring category), and a larger image sensor to provide 2x sharper video during the day and 7x better performance in low-light conditions and at night. Wider field of view. 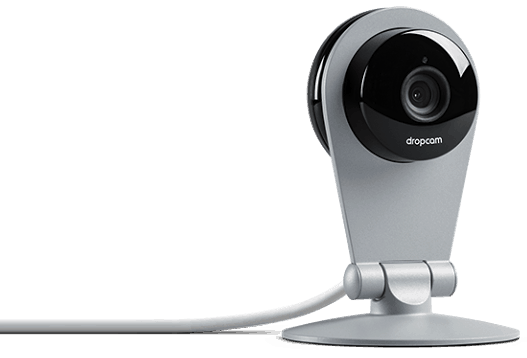 Dropcam Pro supports an amazing 130-degree field of view – 20% wider than the prior-generation Dropcam. Zoom. Dropcam now offers pinch-to-zoom with an enhance feature that supports up to 8x zoom for Dropcam Pro and 4x zoom for Dropcam. Better audio. Dropcam Pro has a new microphone with double the sampling rate and a new speaker for sound that’s louder and clearer. Mobile setup. Get up and running without a computer. You can now set up Dropcam Pro directly from your iOS device (iPhone 4S or later, iPad 3rd generation or later, and iPad mini). Dual band Wi-Fi. 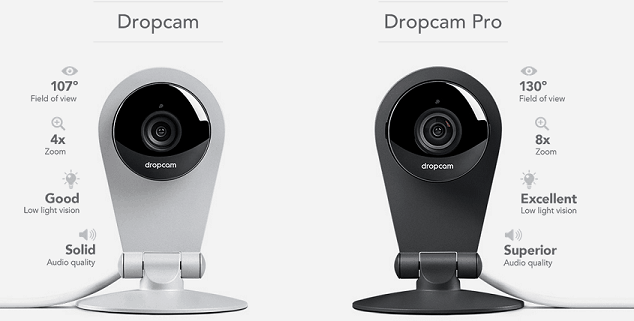 Dropcam Pro supports both 2.4 GHz and 5 GHz Wi-Fi networks for improved wireless connectivity. Activity Recognition (beta). Using advanced computer vision and machine learning technology, Dropcam Cloud Recording can now recognize motion patterns in your video stream and group together like activities. Customers can name these activities and customize alerts for them. Bluetooth LE. Dropcam Pro integrates a low power Bluetooth LE radio that is used for mobile setup and allows Dropcam to integrate with additional devices. Dropcam Pro retails for $199. With both types of cameras, live video monitoring is free. What this means is that I can check anytime and see what is happening at that very moment at home. The Cloud Video Recording was free for the first two weeks and then after that you need to purchase a subscription to keep it running. It lets you watch what happened in the past vs. only watching it live. For instance, the only reason we saw the car break-in was the fact that we had the Cloud Video Recording. I wanted to make it clear that I didn’t have to sit and watch hours of footage to find what happened to our vehicles. 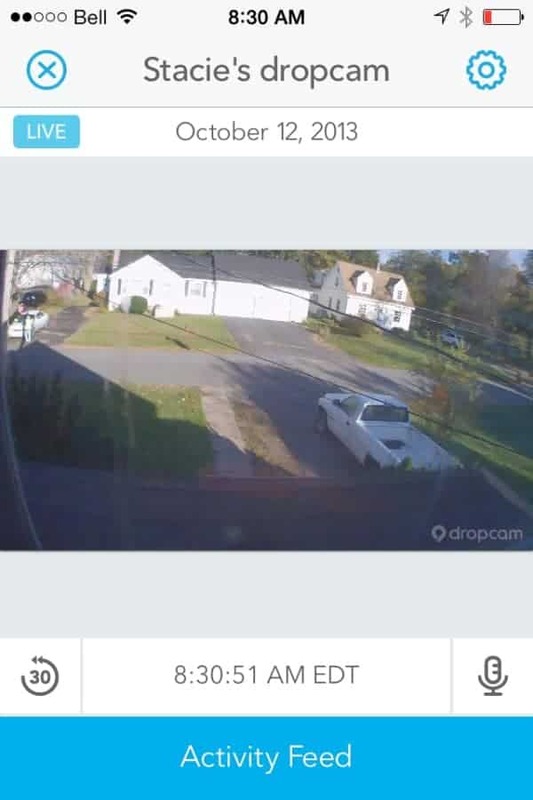 Dropcam has an activity feed and you just click and see the clip of what happened at that point in time. It showed activity at 2:54 am and I went and looked and that’s when I saw the guy going into our cars. The footage is stored securely in the Cloud and you can watch it anytime, anywhere. There’s two plans you can buy: 7 days is $9.95/month and 30 days is $29.95/month. You can also pay by the year. Check out more details on the Cloud Video Recording. You can purchase Dropcam and Dropcam Pro via their website, Amazon.ca and Best Buy. I love my Dropcam and it’s already proved its value to me. I’ve been telling all my family and friends about it and sharing our story about the vehicle break-in. Even if we didn’t catch the thief at least we got the video. I’m making sure to not forget to lock the vehicles, but at least now we’ll be able to see it if it happens again. I’m looking at Dropcam as a possible Christmas gift for a few family members. You can’t put a price on peace of mind! Connect with Dropcam on Facebook, Twitter, YouTube, Google+ and their blog. Wow! So many great features. And I love that you were able to prove your cars were actually being broken into. Too bad you have not yet been able to catch the people doing it, but with the DropCam their day may be coming! Such a terrific piece of security to have on hand. Okay…I am so tempted to get this. We really need some eyes on our home. That’s really neat. I want something like this, you know, just for piece of mind. Wow, we need something like this. We have had people break into our vehicles as well. And there have been other incidents in the neighborhood. I like the fact that you can have it either in the house or outside the house. Very handy!! this sounds like a very good idea, especially if you are away all day or on holiday. I especially like the remote viewing and the fact that the night vision turns on automatically and allows you to see what’s going on even in the dark. I love this product and can imagine how many places I could use it around the house, yard, etc. This sounds like it would be great for peace of mind. We live in a pretty safe town and neighborhood, but you just never know. With this – you WOULD know. Definitely have to look into it. This is pretty great! I would love to see what the dog gets up to when I’m not around! Just had CCTV installed outside and now need Dropcam inside. We’ve been paranoid after a home invasion! I’ve been looking into buying one of these.I can watch on my smart phone,it has 8 times zoom and adjust to low level light.The price is right on this as well. I have been seeing many reviews on this and it looks like a great product. Would love to get one to see what my pets are doing when we are away. Then we can figure out which one of the hour is the one getting into things! How awesome is that! I love that it detects and alerts you! With my cats, it would constantly be catching them in action..hehe ….. Would love to have something like that! We’ve had people take things from our vehicles before, and have been thinking about installing a video camera. Thanks for the review! very cool. love at it detects motion. I would get one just to see the pets when I am not home. What an amazing device! I definitely need this in our home. We have some issues with a part of our street and I’d love to have a video monitoring the activity there. That’s a great review, I would love to be able to test out products and review them like this. Sounds like a really good option particularly for those that travel!